This is a simple browser-based WebApp for "Adding", "Browsing", "Editing" and "Delete" a lot of markers on google map. Each markers well-associated with the street view. 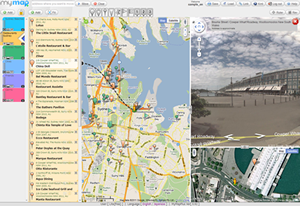 MyMapPlus provides not only functions but also a fun to use the map. Drag&drop marker placement, sorting, grouping, and more things go as smoothly in conjunction with street view. It can significantly reduce time spent organizing map. As you can guess from the name, this project was started to improve the disappointing aspect of google my maps. It is a general request, but the google my maps is still better than any other map apps. However, in order to manage numerous markers, google my maps feature should not be enough. MyMapPlus can do it more quickly and efficiently. Editing by browser, bring outside with iPhone.